The Aubin Tonalamatl is a Nahuatl codex which consists of eighteen screen-folded pages on maguey bark paper. It is constructed out of thirteen bark pieces that were pasted together, and it is meant to be read from right to left (Star 1902). It contains the 260 symbols that represent the tonalpohualli, or the count of days. The codex would originally have been 20 pages long, but the first two pages have been lost. The pages are painted on one side and the contents relate to divination, recording the omens associated with particular days (Star 1902). It seems to have originated in the Mexican state of Tlaxcala, based on where it was collected (Quiñones Keber 2001: 61-62). The Aubin Tonalamatl first appears as ‘kalendario ydolatrico’ in the inventory of a collection of ancient Mexican manuscripts that were owned by Italian aristocrat Lorenzo Boturini Benaduci (Quiñones Keber 2001: 61-62). The inventory was created as a result of the confiscation of the manuscripts after Benaduci was expelled from New Spain in 1743, and at that point the codex passed into the hands of the local colonial government that sold the document on (Star 1902). A portion of the codex (pages 9 through 20) seems to have been sold in or after 1802 from the estate of Mexican astronomer Antonio de León y Gama to two travelling artists: Carl Nebel and Jean-Frédéric Waldek. It is possible that Nebel purchased the codex then sold it on to Waldek. Waldek sold the codex to Joseph Marius Alexis Aubin in Paris in 1841. Aubin eventually obtained pages 3 through 8 of the codex, but it is unclear when and under what circumstances. The complete document was purchased by Charles Eugène Espidon Goupil in 1889 along with 383 other Mesoamerican manuscripts from the Aubin collection. The Aubin Tonalamatl was then donated to the Bibliothèque Nationale de Paris by Goupil’s widow in 1898 (Quiñones Keber 2001: 61-62). 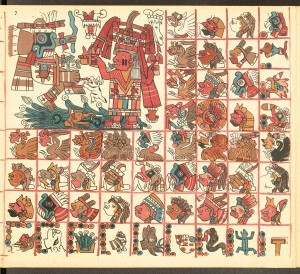 In 1982 a 36-year-old Mexican attorney and journalist named José Luis Castañeda del Valle stole the Aubin Tonalamatl from the Bibliothèque National. Castañeda carried the codex to Mexico and eventually donated it to the Biblioteca del Instituto Nacional de Antropología e Historia. According to contemporary reports in El País (Mueller 1982), in June 1982 Castañeda presented himself to the Bibliothèque Nationale as a student and requested to see the Aubin Tonalamatl. 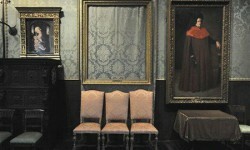 The head of the library initially refused his request but, as Castañeda provided all necessary documents and an address, he was granted access to the manuscript. Once left alone, Castañeda put the codex under his jacket, retrieved his authorised reader card, and walked out of the library. Shortly after the theft, France formally requested that the codex be returned from Mexico. Castañeda had provided the Bibliothèque Nationale his real address when he registered as a reader and he was arrested at his residence in Cancus, Mexico in August 1982 (Mueller 1982). Castañeda instantly admitted the theft, claiming that he had rescued Mexico’s cultural heritage from Europe in an act of nationalism (Greenfield 1986: 33). According to his attorney, Castañeda had become upset by the idea of Mexican manuscripts being housed in European collections while writing various articles on Mexico’s ancient past. Castañeda (quoted in Mueller 1982) stated ‘I had the idea to start a nationalist movement for the recovery of codices’, and that the theft in Paris was the first ‘recovery’ of this movement. The Mexican press covered the theft as an act of nationalistic heroism, going as far as to thank him for it (Mueller 1982). Based on the eighth article of the General Constitution of the Republic, the Mexican Codex, improperly called the Tonalamatl of Aubin, should be ratified as an archaeological monument, in accordance with the Federal Law of Monuments and Archaeological Areas in effect… (Quoted in Herner 1991). After much discussion, it was decided that the Aubin Tonalamatl would stay in Mexico in an agreement that had to be revisited every three years (Herner 1991). As of 2009 the INAH and the Bibliothèque Nationale were working out an agreement that would allow Mexico to keep the Aubin Tonalamatl on permanent loan (Fernandez 2009). Fernandez, Chloe (2009), ‘INAH to Keep Codex Stolen from French National Library’, Museo Nacional de Antropología Weblog. http://mexiconationalmuseumanthropology.blogspot.com/2009/02/inah-and-stolen-maya-codex-from-french.html, accessed on 7 August 2012. Greenfield, Jeanette (1986), ‘The return of cultural property’, Antiquity, 60, 29–35. Herner, Irene (1991), ‘El patrimono cultural y la ley’, Nexos, 11 January. Mueller, Enrique (1982), ‘Liberdad en México para el autor de la ‘recuperación’ de un códice de la Biblioteca Nacional de París’, El País, 30 August. Quiñones Keber, Eloise (2001), ‘Aubin Tonalamatl’, in David Carrasco (ed. ), Oxford Encyclopedia of Mesoamerican Cultures (Oxford: Oxford University Press), 61-62. Starr, Frederick (1902), ‘Book Review of The Tonalamatl of the Aubin Collection’, American Anthropologist, 4, 145–47. The similarly named ‘Aubin Codex’ is an entirely different document held by the British Museum.